Hi. 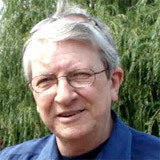 I'm Phil Basten, and if you are like me, you have joined many sites and lists and you stored the links and the logins in many different places. Chances are you forgot a lot of sites you joined and you wouldn't even know where to start looking for the logins. You buy something new and exciting and you are just about to file it when you get called away for dinner, or to answer the phone, or a hundred other distractions that come your way each day, and you think, "I'll file it in a safe place and figure it out later," and you forget about it. The problem is you end up with so many safe places you forget where any of them are. Your links are safe. Safe from you. It's frustrating and time consuming trying to find the stuff you bought and filed. I know, it's happened to me, many, many times. Easy Links Finder is perfect for marketers, business owners, online shoppers, or literally anyone who wants to be able to find and organize all their favorite links, usernames, and passwords safely in one simple location. You can find any site instantly. No more wasted time searching for links to all the sites you belong to. 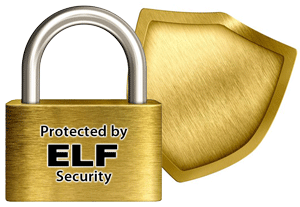 Simply enter them into ELF, safely and securely, and you are done. 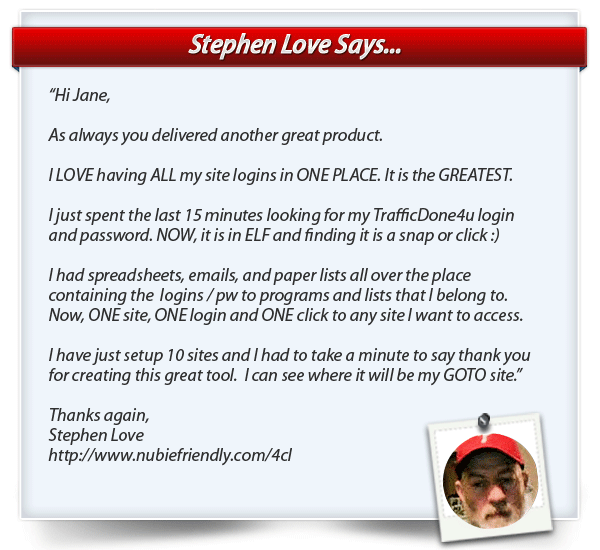 Never misplace your sites or logins again. Use our internal search tool to locate links in seconds. You can add any site easily. You can add your login links, usernames, and passwords for marketing sites, mailing sites, social sites, affiliate links, shopping sites, blogs, PLR sites, software sites, personal and business contacts. You name it. Login to any site from ELF. No more lost usernames or passwords. You will have them right at your finger tips. ELF makes it super easy to find what you need. Login to ELF then login direct to any site you enter. It's as easy as 1-2-3. You can use our categories or create your own. Simply enter a category name for the type of website you want to enter and click save. You can even choose the categories you want to show or hide on the menu. Elf arranges your sites alphabetically. This is especially convenient if you have a lot of sites like mailing lists or traffic exchange sites and you want to find one simply by scanning a well-organized list. ELF does this automatically for you. ELF displays the mailing frequency, and allows you to update the day you mailed with 1-click. No more wasted time logging into a site only to find out you cannot mail for another 24 hours. You will always know exactly when it is time to mail again at a glance. Each time you add a new affiliate link to ELF. Your new entry will ping a message with your ELF affiliate link to special sites that all the major search engines crawl and let them know where to find your new links and content. Each time you add a new link to ELF, you can instantly post a message to Facebook, Twitter, and Sokule to let your followers know that you just added a new link at ELF. This message will contain your ELF affiliate link. ELF lets you tell other members what you are interested in. 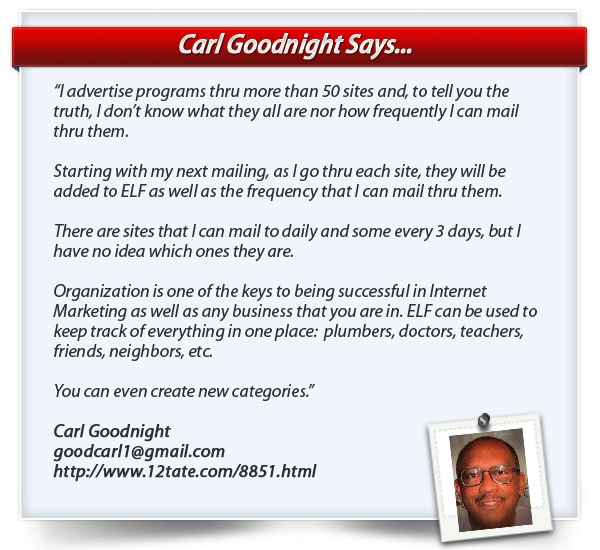 Just click the share button and your affiliate link will be added to the ELF members share page. Each link your share will rotate in this section for a full 30 days. It doesn't get easier than this. Stop struggling. 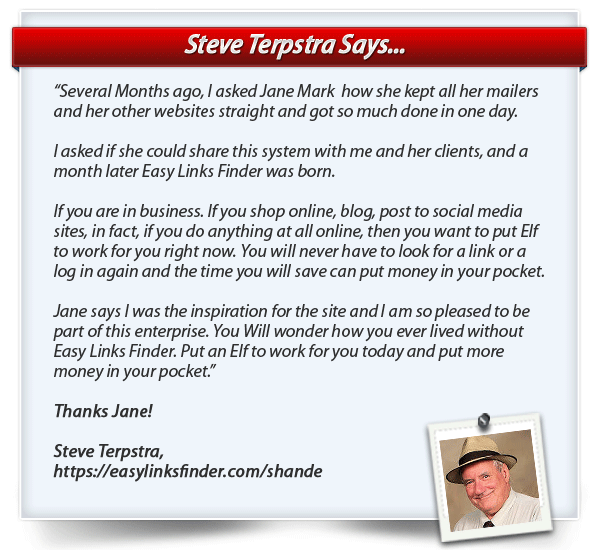 Making money online can be fun and easy, especially with Easy Links Finder. Want hard copies of sites you mailed too and those not mailed to? Simply download a csv file each day. This is perfect if your staff or virtual assistant is doing your mailing for you. You can literally save hours each day. Time you can put to much better use. Get more marketing, product creation, writing done each day, make more money, and spend more time with family and friends enjoying life. 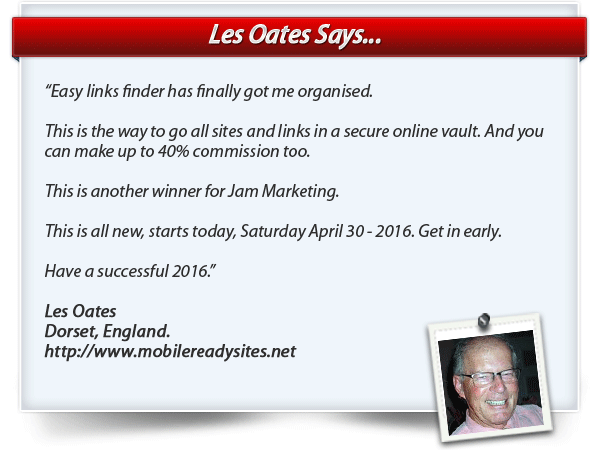 Grab Easy Links Finder today and make your life easier. Sokule List Building Credits Bonuses - Sokule sokens (credits) build your Sokule list automatically for you. ELF Managers get 1 million sokens (value $1270.00), ELF Supervisors get $3 million Sokens (value $3810.00), and ELF CEO's get 6 million sokens (value $7620.00). If you purchase a CEO account and you are an existing TrafficDone4u member, we will add 1 free campaign to your account and set up your ELF Affiliate Link for you. This is a special bonus just for TrafficDone4u (TD4U) members. (Value $250.00).